You are currently browsing articles tagged Turkish food. 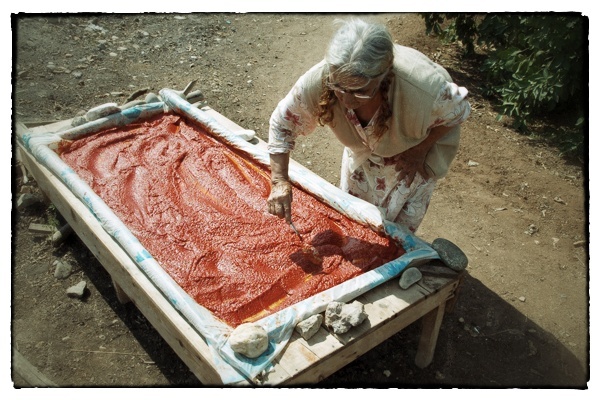 Making Turkish salca (tomato puree). In fact, tomatoes are coming so fast and furiously to every market that people have begun making salca, a traditional Turkish tomato puree that is added to just about every savory dish imaginable. To make salca, you take tomatoes—usually plum tomatoes—and ferment them in large plastic sacks or tubs, usually up on your roof. Then it’s rubbed through a sieve, mixed with garlic and salt, poured in to shallow troughs or tubs and put back on the roof where it is stirred every now and again until the liquid thickens and the water evaporates. For those without the tomatoes (or space) to make their own salca, you can buy little plastic bags of ready-made salca in just about every market in Istanbul this time of year. What do you call a turkey in Turkey? 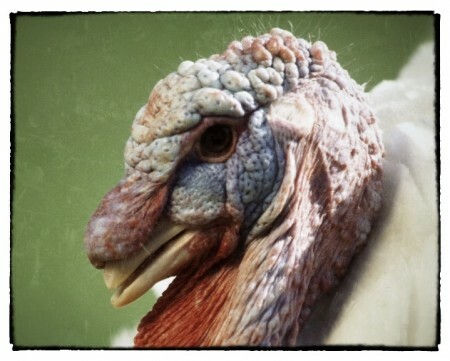 Does this look like a Turk to you? Here’s something I just found out today: Do you know why we call that big bird we roast at Thanksgiving a “turkey?” Because Turks introduced Europeans to the bird, so that’s what they called them. You never knew that, right? So what do you think a turkey (the bird) is called in Turkey? It’s called a “hindi.” Which is the Turkish word for something from India, a confusion of India and the Indies (i.e., the Americas) which is where the big blustery bird actually heralds from. The Pudding Shop. Photo by David Lansing. Sidar and I were wandering somewhat aimlessly around the Sultanahmet neighborhood of Istanbul. It was hot and I was getting tired and hungry. “I have a very special place where we’re going to have lunch,” he said. It’s taken me awhile but I now realize that when Sidar says something like this what he really means is that he has no idea where we’re going to go but he’ll figure it out as we’re walking along. We were walking up Divanyolu, a pleasant if somewhat touristy street. There were a ton of restaurants but none of them looked quite right to Sidar. Until we hit the Pudding Shop. There’s a movie there, don’t you think? The Pudding Shop is actually the nickname of the Lale Restaurant. Back in the 60s when hippies passed through here on their way to Greece or Bulgaria, if they were headed for Europe, or Iran or Afghanistan, if they were headed for Asia, they’d agree to meet up at “the pudding shop” because they couldn’t remember the real name of the restaurant close to the Haghia Sophia. They just remembered that it served cheap but excellent Turkish pudding. So, of course, in addtion to our köfte and stuffed grape leaves, we got little dishes of asure—Noah’s pudding—which is an odd mix of beans (fava, navy, chickpeas) and grain (barley and rice) with dried figs, apricots, and raisins. Now, I don’t know what the Noah’s pudding was like at the Pudding Shop during the 60s (undoubtedly part of the attraction was that it was cheap, nutritious, and filling) but this stuff was pretty disgusting (or, in fairness, maybe my taste buds just couldn’t get past the barley-dried figs-cinnamon combo). In any case, one or two bites was plenty. Still, it was fun just to sit here and enjoy our Efes and imagine all the freaks that had passed this way a long, long time ago. By the way, the map of the hippie trail is courtesy of Richard Gregory who traveled, at age 19, from the U.K. to India and Nepal back in 1974 and subsequently wrote a brief memoir of the trip almost 30 years later. 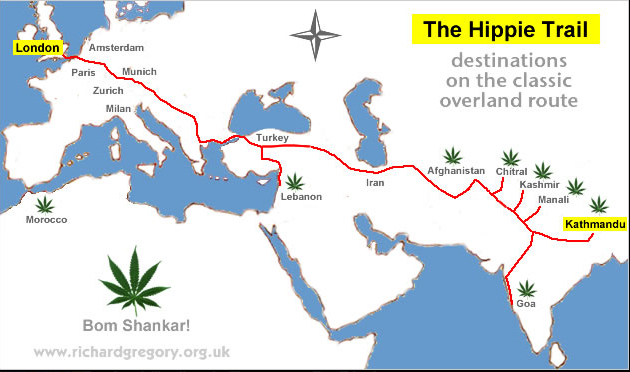 If you’re curious about it, you can read A Brief History of the Hippie Trail here. Meze photo by David Lansing. 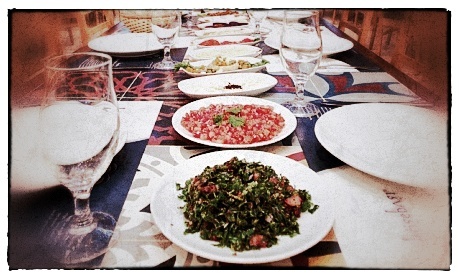 Meze is an event rather than a type of dish. It’s an evening gathering of family and friends for drinking, chatting, and leisurely grazing on nibbles and tidbits. The defining feature of meze is that people are there to partake; there’s no prescription for what must appear on the table. A spread could be as simple as bread, white cheese, and melon. It could be as bar-snacky as nuts and olives. 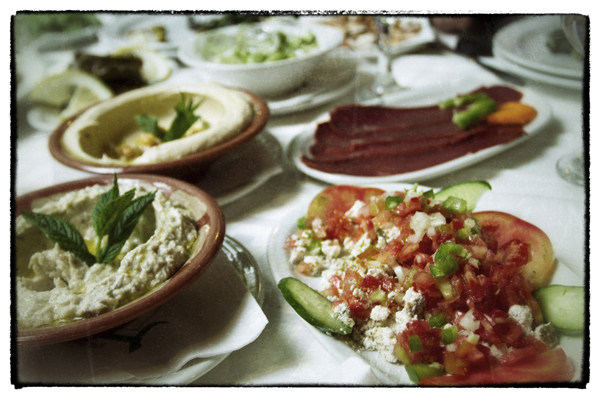 A more substantial meze will often constitute the whole meal and last for hours. This is the one course that Turks don’t mind lingering over; as long as there’s still a smattering of food and something in the raki bottle, the meze will continue. 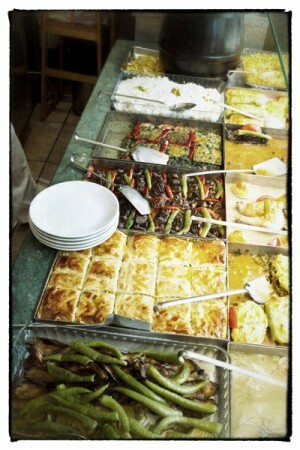 Most Turks find meze unthinkable without raki. Indeed, much meze lore relates to what tastes best with a tipple and what guards the body against the ill effects of alcohol. Purists insist that fruit, especially melon, is the only authentic and healthy meze. Others put olives and white cheese on the essentials list. In summer, many invite erik (plum), often dipped in salt, to their table. Toros salata, bottom, and the classic gavurdagi salata at Kosebasi in Istanbul. I said yesterday that when you order a raki, the anise-flavored Turkish spirit made from either fresh grapes or, more likely, well-preserved dried grapes, that you should order a meze or two. Or three or five. At Kosebasi, the kebab place Sidar took me to, we didn’t even have a chance to look at the menu before plate after plate of this-and-that starting arriving: raw meatballs with scallions and fine bulghur (cig kofte); thin Turkish pizza covered with highly seasoned meat and veggies (lahmacun); classic Turkish pita (balon) to wrap around broiled eggplant with yoghurt and olive oil or rich hummus. And then came the salads: toros, a snappy Turkish salad made with arugula, water cress, green onion, mint and flavored with a sour pomegranate syrup and Kosebasi’s famous gavurdagi salata—diced tomatoes (“Only when in season,” our waiter told us), onion, parsley, and Turkish herbs (such as sumac, which I had always thought was poisonous), the whole mixture drizzled with fresh lemon juice. “So, what do you think?” Sidar asked me as I looked over the many plates on our table. “I think perhaps we should have another raki,” I said.